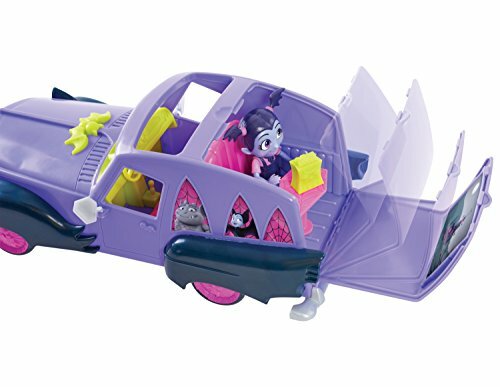 Vampirina Huntley's Mobile vehicle transforms into a drive in cinema. 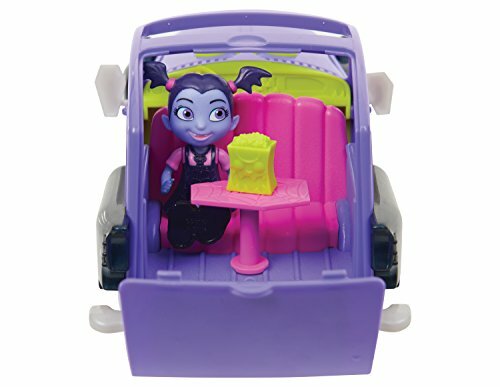 Vehicle features light up head lights and Vampirina-themed details. Press the bat button to activate fun light-up effects and sounds from the show! Set comes with a 7.5cm poseable Vampirina figure. Includes a popcorn and table accessory. 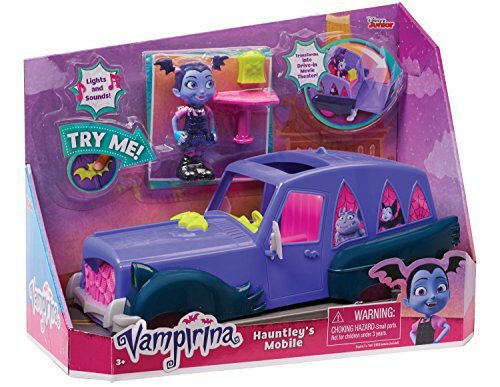 Now fans of the Disney Junior s new preschool series, Vampirine can join in on some seriously bat-tactic adventures with the Vampirine Huntley's Mobile. 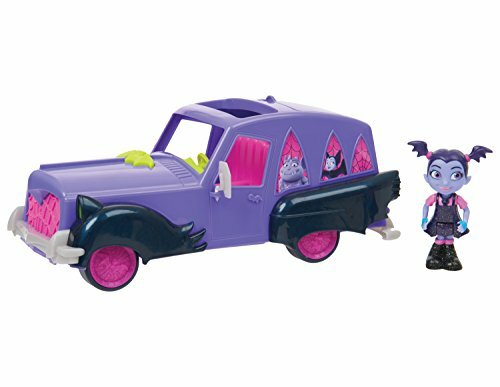 This amazing vehicle set features a bright purple colour with fun bat-themed details that transforms into a spook-tabular drive-in cinema. Whether it s a fun-filled ride or a spooky movie, kids can transform the vehicle into a ride-in-style experience when they open-up the back to reveal a bat-tactic table, bench and movie screen! Press the bat button on Huntley's Mobile bonnet to activate the fun head lights and hear Vampirine phrases, spectacular sound effects and music. The set comes with a 7.5cm poseable Vampirine figure in her signature web-tactic outfit! The set also includes: 'spook-tabular' table and a monstrous bag of play popcorn for the perfect moonlight movie experience. Be sure to also look for the Vampirine Fantastic Friends Figure Set (sold separately) that includes even more Vampirine characters from the show to join the party! Suitable for ages 3 and above. Requires 2 x AAA batteries (included). Contents: 1 Mobile with lights and sounds, 1 Vampirine Figure.